I was a teen when Jurassic Park came out in 1993, and the film was one that really cemented my love of cinematic storytelling. The story was rich, characters were deep and well-defined, the look was vibrant and the effects were mind-blowing. It’s now 20 years later and none of these elements has aged a day, and are only enhanced by the remarkable 3D conversion. Even without the extra dimension, Jurassic Park had always looked absolutely stunning. Spielberg expertly composed every shot of the film, and it always had layers of structure – with spatial relations of characters, lush vegetation, gadgetry and…dinosaurs. Even scenes that seem to have a simple look are extraordinary. The naysaying kid at the archeological dig being given a lesson by Dr. Alan Grant (Sam Neill) and his raptor claw really pops with the kid standing alone beyond the crowd of workers. When Grant and Dr. Sattler (Laura Dern) enter the claustrophobic trailer and are greeted by a champagne-popping, dino- theme-park creator John Hammond (Richard Attenborough) the 3D effect really helps give a confining feel. Just as I was in the theater 20 years ago, I was hooked at the outset with the opening raptor sequence. The layers of foliage and light beams shining through the cage were brought to life in a whole new way. And the mouth of Muldoon (Bob Peck) urging his colleagues to “Shoot her!” is another level of eerie. Really, you could go through the entire runtime of the film to point out specific shots that dazzle – from the initial childlike excitement of Grant and Sattler when they first see the Brachiosaurus to the appearance of the menacing T-Rex. This creature remains one of the greatest creations of cinema – not only has it held up, but it looks better than almost anything that has been released since. It feels like it is there terrorizing those two jeeps. The footprints, the howls, the tiny arms, the breath on the window, the dialing pupil - all perfection. The human characters are still poignant as well. Dr. Grant’s journey from old school professional, to giddy schoolboy in the face of discovery to protector of the two actual kids is subtle, but not so much so that it goes unnoticed. Jeff Goldblum as Dr. Ian Malcolm still steals the show for me. As a kid, it was because he was a fast talker with cool dark glasses and a leather coat. Now, it’s because a lot of his kooky ramblings make a lot of actual sense. His “God creates dinosaurs…” speech or “life finds a way” line are more than just sound bites for a trailer; they have real depth and meaning applicable to any generation. If I have one complaint about the film it is that Malcolm pretty much disappears after the initial T-Rex attack. But there is much more than enough to sustain the action until the climactic dash from the raptors. The great thing about the finale is that it’s not a tacked-on action sequence just for the sake of having one. It is an organic progression that fits the themes of man’s lack of control in the face of scientific creation. 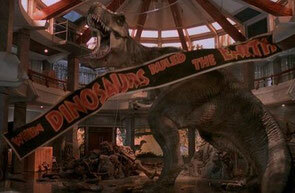 As the “When Dinosaurs Ruled the Earth” banner drops in front of the triumphant, screaming T-Rex and the humans flee Isla Nublar, the inevitabilities of the narrative have naturally played out. Jurassic Park is a true benchmark of cinematic achievement and is by far the best film currently in theaters two decades after its initial release.